The Isle of Purbeck in Dorset, although not an actual island, is a 60 square mile peninsula jutting into the English Channel. It is bordered by water on three sides the English Channel to the south and east, where steep cliffs fall to the sea and by the marshy lands of the River Frome and Poole Harbour to the north. In the past the low lying land to the west would have been very boggy and difficult to cross, hence the Isle of Purbeck. A ridge of Cretaceous chalk runs along the peninsula creating the Purbeck Hills, part of the Southern England Chalk Formation that includes Salisbury Plain, the Dorset Downs and the Isle of White. The cliffs here are some of the most spectacular in England, and of great geological interest, both for the rock types and variety of landforms such as Lulworth Cove and Durdle Door. The Purbeck coast is part of the 95 mile stretch known as the Jurassic Coast named England’s first natural World Heritage Site in 2002 because of the unique insight it offers into 185 million years of the Earth’s history. A large part of the Isle is now designated as an Area of Outstanding Natural Beauty but a portion of the coast around Worbarrow Bay and the ghost village of Tyneham is still after 60 years in the possession of the Ministry of Defence who use it as a training area. For safety reasons right of entry is only given when the army ranges are not in operation. When the ranges are in use red flags are flown and flashing warning lamps on Bindon Hill and St Alban’s Head are lit, the gates locked and wardens patrol the area. In the past the quarrying of the local stone, known as Purbeck marble, a fossiliferous limestone was the main industry. Purbeck marble was used for tombs, alters and fonts in cathedrals all over England and much of London was rebuilt in Portland and Purbeck stone after the Great Fire of London in 1666. Wareham would have been the first settlement in the area easily reached by road and rail but today the town is an ideal place to explore the Purbeck coast. Kingston is a small village on the Isle of Purbeck in the county of Dorset situated two miles south of Corfe Castle and five miles west of Swanage. The village which is surrounded by woods sits on a hill near Swyre Head, the highest point of the Purbeck Hills. Kingston is notable for its two churches. Since the 12th century up until 1877 Kingston had been a chapelry of Corfe Castle and a chapel, served by the Rector of Corfe Castle, stood on the east side of the village. In 1833 the chapel was replaced with the present church building by John Scott, the first Earl of Eldon, who along with his wife is buried in the churchyard. The old church remained in use as the church hall for many years but later became disused and is now a private residence. The other church, St James’s Church, built in 1874 and completed in 1880 by the third Earl of Eldon, is quite elaborate and resembles a miniature of an early English cathedral. There was also a Wesleyan chapel, built in 1861, at the foot of Kingston Hill which is now a private residence. The old school house now also a private residence was erected in 1856 in memory of the Earl and Countess of Eldon by their children. The village pub dating from 1787 was originally known as the New Inn. It became the Eldon Arms in the early 19th century then after the Second World War the name was changed again to The Scott Arms. Corfe Castle village, a popular and very attractive village about 5 miles south of Wareham, is named and famous for the dramatic ruined stone castle that rises above the village. The village on the Isle of Purbeck is built mostly from the local grey Purbeck limestone and comprises of two main streets, East Street and West Street, linked at their north end at the Square. The two streets are separated by an area of common land called ‘the halves’. The Square, with its cross commemorating Queen Victoria’s Diamond Jubilee of 1897, is surrounded by a collection of shops, the post office, the church and pubs. The main street though Corfe is East Street, forming part of the A351, which takes traffic to Wareham to the north and Swanage to the south. The 13th century parish Church of King Edward, King and Martyr is dedicated to King Edward who was killed in 978, reputedly on the orders of his wicked step mother so that her own son Ethelred the Unready could become King of England. It is said that the church stands on the site of a blind woman’s cottage where the king’s body was taken after the murder. By 1859 the state of the church was so bad that everything except the tower was demolished and a new church in gothic style built. The Swanage Railway is one of Britain’s most popular heritage railways with steam trains running every day between April and October. During the busy periods there are two steam trains a day providing a 40 minute service between Norden Park and Ride at Corfe Castle, Harmans Cross and Swanage. During the quiet periods the trains run at weekends. During the Swanage Carnival week there is an extended evening service and there are Special Weekends such as the annual Diesel Gala, two Steam Galas and also Santa’s Specials from Swanage. Corfe station has fabulous views across to the castle and the station itself is a wonderful recreation of a 1950’s railway station. The signal box has won a national heritage award and at the back of the station is a free railway museum. There is also a museum in the old town hall, near the church, which claims to be the smallest town hall in England. 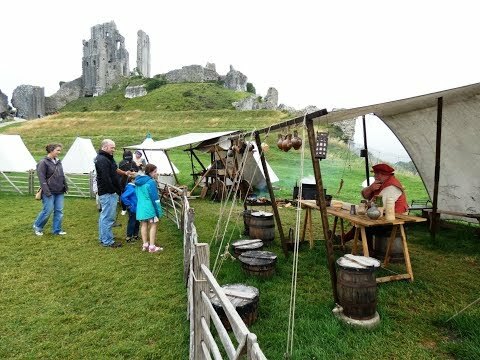 At Corfe Castle Model Village you can step back in time to the year 1646 and see Corfe’s heritage castle and ancient village in Purbeck stone at 1/20th scale. Stroll into the past and compare the castle as it was 300 years ago with the ruin as it is today then visit the enchanting traditional Dorset garden. Tended for many generations the gardens have now been restored to their former glory with many rare trees and shrubs among beautiful traditional English borders. While you are there why not relax in the Courtyard Cafe over a coffee, a full Dorset cream tea, a light lunch or snack. The model village, Dorset garden, and the cafe are open from Easter to 31st October. Corfe Castle built in stone in 1086 by William the Conqueror, replacing a wooden Saxon building, was one of the country’s great strongholds. The dramatic ruins of the castle stand on a natural hill in the Purbeck Ridge guarding the main route through the Purbeck Hills. It guards the gap between the south of Purbeck and the rest of England so that nothing could pass in or out without going past the castle. For the next six hundred years it was a royal fortress used by the monarchs of England. The last royal owner, Queen Elizabeth I, sold Corfe Castle to one of her favourites, Sir Christopher Hatton. Sir John Bankes, Lord Chief Justice, bought the castle in 1635 and during the English Civil War (1642-51) his wife Lady Mary Bankes led the defence of the castle when it was held siege twice by Parliamentary forces. The first siege in 1643 was unsuccessful but by 1645 Corfe Castle was one of the last remaining royalist strongholds in southern England and Colonel Bingham Governor of Poole started a second siege and the castle was captured due to treachery within the castle walls allowing a Parliamentary force into the castle in February 1646. For Lady Mary’s heroic efforts the Bankes family were allowed to leave the Castle before it was destroyed with gunpowder by Oliver Cromwell’s sappers to stop the castle from being used in the future. Some of the ruined stone was used in the building of the village and the houses are built of local stone making it one of the most attractive villages in Dorset. The castle remained in the ownership of the Bankes family until 1982 when it was then given, as part of the Kingstone Lacy and Corfe Castle estate, to the National Trust by Mr H.J.R Bankes. The Castle is a great day out for all ages. Children can pick up an activity sheet and go on a quest around the castle. Try on costumes and pose with helmets, shields and swords. There are a variety of family events throughout the year. The Purbeck Way is a 27¾ mile walking route which runs from Wareham via Corfe Castle, Ballard Down and Chapman’s Pool to Swanage taking in the outstanding scenery of the Isle of Purbeck. From the car park at Kingston we head to the road and turn right. At the first building we turn left and follow the track into the trees past the garages on our left to a gate. We go through the gate and turn right passing a building on the right. We keep following the track to Blashenwell Farm where we turn left going through the centre of the farm, passing a waterwheel on the right, to pass through a gate. We now follow the tarmac track turning right at the t-junction and then continue through the open access land until we reach the road leading into Corfe Castle village. We continue forward along the road into the centre and wander around before we go into the castle. After visiting the heritage steam railway and the castle we continue back down the road we came in on with the church on our left but when the road bends to the right we turn left at the sign post ‘East Street Picnic Area and Playground’. We follow the path then turn right at the sign post ‘kingston and Chapmans Pool’. We then head forward through the fields going through the gates towards the houses. At the end of the third field we turn left following the sign post for Kingston. We come out at a road and we cross straight over into the cul-de-sac opposite. We then head forward along a narrow alley and soon come out into open access land. We head forward to the end of the houses on our left and down into a dip. We turn left and make our way to the gate. We go through the gate cross over the road and through the gate opposite. We follow the grass path bearing right at the small stone way-marker going slightly downhill to cross a footbridge. We head forward with the hedge on our left then just past the shed we go through the gate on the left into the field and turn right following the hedge on our right. At the end of the field we go through the gate into the next field and turn right. We head forward to the corner of the field to through the next gate. We head forward through another field slightly uphill with the tees on our right then at the top of the field we go through the gate on the right hidden by undergrowth. We now keep bearing left, ignoring an iron gate on the right, to a stony track we turn right at the sign post going slightly uphill. We soon turn right again at the post going through the hedge. We follow a narrow path through the undergrowth then when the path splits we turn right. We soon cross over a stile into open grassland and keep heading forward following the telegraph poles with the hedge on our right towards Kingston in the distance. When we reach the road we turn right then at the Scott Arms we bear left past the church back to the car park. This is an easy walk on minor tarmac road and tracks and grass / gravel paths and tracks through fields. Approx 5¼ miles allow 2½ – 3 hours for the walk using OS Explorer Map OL15, Purbeck and south Dorset. Allow extra time if visiting the castle. This walk is done clockwise. Start Point: free car park at Kingston. Kingston and Corfe Castle, Isle of Purbeck in West Dorset. Travelling on the A35 between Dorchester and Poole take the A351 or the B3075 to Wareham and continue on the A351 to Corfe Castle. On leaving the village take the first right onto the B3069 to Kingston. At the sharp left hand bend take the small road on the right past the church. The car park is just beyond on the left. Parking: Free car park at Kingston. There are also two car parks at Corfe Castle, the one in West Street is Pay and Display £1.60 for two hours and the other one is Park and Ride. There are public toilets near the Castle itself. For refreshments in Corfe Castle there is the Norden House Restaurant, the National Trust Tea Rooms, the Courtyard Cafe and Tea Room and three pubs the Castle Inn, the Greyhound Inn and the Bankes Arms. There are also some shops. In Kingston there is the Scott Arms.